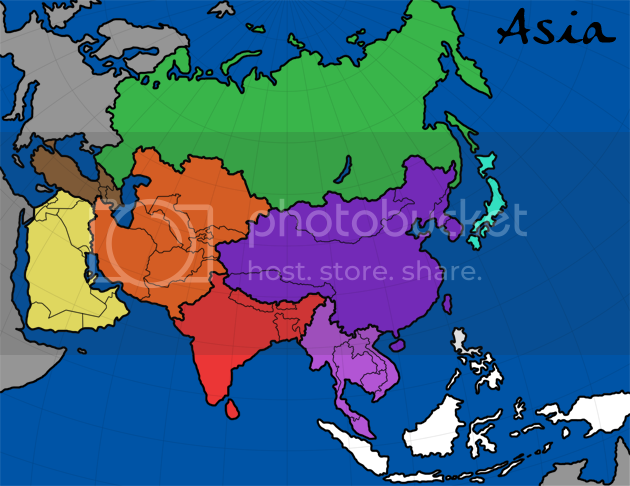 Map Name: Asia / Greater Asia? / Asian Continent? I've had this update for some time, although it definitely needs a lot more work yet! I'm not convinced about breaking Russia up - I quite like it as one big territory (but that's just me, I guess). I've added territory names, and started playing around with getting them to fit... it's definitely going to be a squeeze in some areas, but I'll work on that in due course. The region groupings are still tentative, although for the most part I think they make sense how they are. Pakistan could easily be shifted into the Indian Subcontinent, and would probably make that a better bonus, although it would make the "Stans" a lot harder to hold. I'll probably add a couple of extra island territories in due course; but for now the discussion should continue around sensible bonus regions, and any natural impassables that could be added in sensible places. I am proposing a new map of Asia that, like Europa, would contain every nation-state on the continent. There will be some major issues to iron out because some countries dwarf their neighbors in Asia, but it worked out really well with Europa and I think it can be done here. So the goal of this project is to construct a graphically pleasing Asia map that stretches all the way from Yemen to Japan and from Indonesia to Turkey. So with the basic concept out of the way, here's an initial design brief. ???? - This might be my biggest stumbling block of all! To my knowledge, there's no natural metropolitan name equivalent to "Europa." 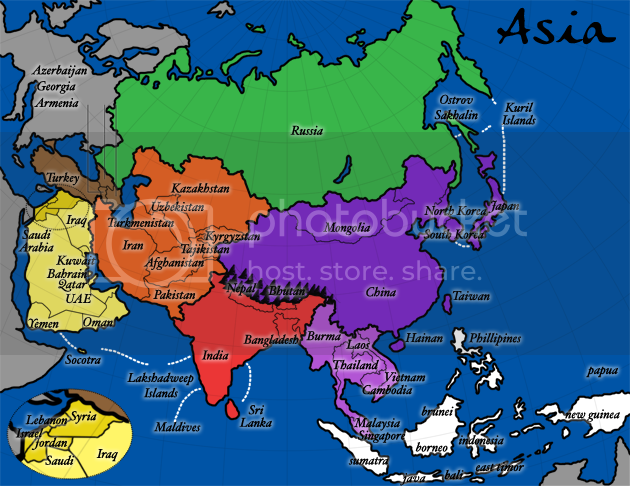 And "Asia 2" is out because it signifies a revamp. "New Asia" also makes zero sense. I'm racking by brain but hoping that someone in the foundry will have the creative spark. I'm leaving this one to MrBrenn to fill in. I recruited him because I thought he might be intrigued about creating a follow-up to Europa. I'd be happy for him to pursue a similar design, but I'm also very much open to it being taken in an entirely new graphical direction. In other words, watch this space! Me? Well, none--other than offering my occasional two cents on about 20 or so maps that have gone through the foundry. But I am partnering with a somewhat experienced cartographer! So, with that, the idea is out there. MrBrenn and I have exchanged PMs and I'm posting this per his instructions. I'm sure we should get a little discussion going here before he launches into an initial draft, so have at it! Is this a map that people would like to see? If so, as I hope, what sort of input do people have to offer? There are gameplay hurdles to overcome as I've mentioned (I'm imagining we need some impassables, unlike Europa), so all ideas are welcome because other than the general thought of "hey, let's have an Asian map like Europa!" I haven't hashed this out too far. Anyway, those are two options I've thought of to start because I didn't just want to throw a map idea out there without some structure. I've got a feeling neither of these will be used, but hopefully they help direct discussion. 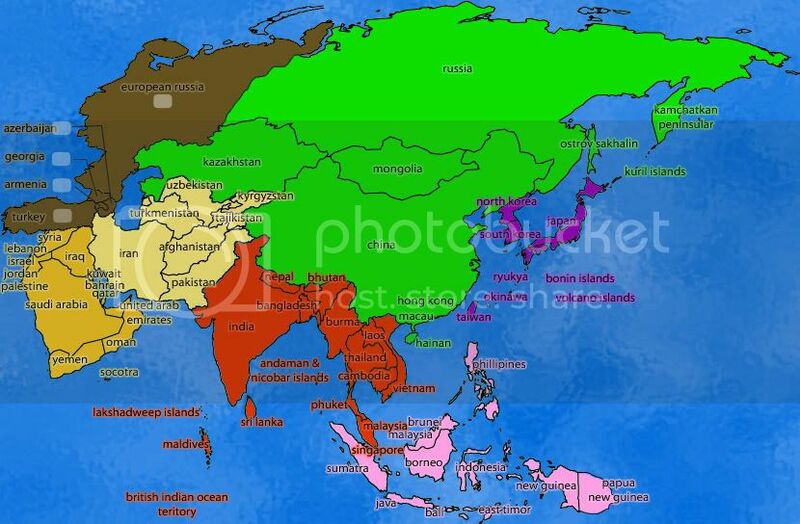 Rename current map Far East, new will be Asia. Only downside is that it may be confusing [to] have the name be with a new map. Last edited by cubfanpgh on Thu Jan 21, 2010 11:44 am, edited 1 time in total. Ps. You could always call yours "Asia 2.1"
I like it. I'd play it. More responses when a draft if posted. Nice. I think you should still represent the non-playable terts, though. I really like that water texture. It might look good if it was darkened so as to bring out more contrast with the land. Nice look; it reminds me of Europa (I wonder why?). However, after looking at the map, I realized that we'll get into the whole Israel/Palestine issue. From what I remember, there was a huge argument apropos of the Middle East map and the Israel Palestine issue. Certain borders might need to either be exaggerated or glossed over, like Afghanistan-China and North Korea-Russia. The Middle East rectangle from Qatar to Lebanon might have to be in an insert because of the smallness of the countries involved. ^ why is there pacman's face in the east shore of china? I prefer Dim's allocation of areas in Asia, it seems more natural to me. And that little dip in China's western border... isn't that Chinese Kashmir and part of China? After a little bit of thought, I was going to suggest something a bit more like that; although I still think there need to be some smaller regions to give people somewhere to start. I've spent the evening looking at map projections (http://www.quadibloc.com/maps/mapint.htm ), and have found an Azimuthal equidistant projection that makes the Middle East a bit bigger without distorting the rest of the continent. I'll sketch out the new land borders at some point over the weekend I imagine; in the meantime, any further suggestions for groupings would be gratefully received. I see the sense in keeping all of Russia as a single continent, although the Transcontinental region made a nice little starting bloc. It makes sense to add Kazakhstan to the region with the other -stans which also makes that bloc defendable. The Middle East will link up with India via an ocean route between socotra (Yemenese Islands) and the Lakshadweep islands. I like the grouping for India that DIMwit suggested, although I expect we might need an impassable between nepal/bhutan and china? With Indonesia, we'll need to decide what to do with Malaysia, which occupies two separate landmasses. I included Papua New Guinea for completeness, even though it isn't technically in Asia! Japan and the Japanese islands could make for a nice small bonus, separate from China. That's just some random thoughts for now! MrBenn wrote: After a little bit of thought, I was going to suggest something a bit more like that; although I still think there need to be some smaller regions to give people somewhere to start. In the Middle East, we could separate the Arabian Peninsula from the Fertile Crescent. MrBenn wrote: I like the grouping for India that DIMwit suggested, although I expect we might need an impassable between nepal/bhutan and china? Agreed; it makes both geographic and gameplay sense. Hmm... I think a Japan, Japanese Islands, South Korea, Taiwan bonus could work well as a small area. Might as well include Papua New Guinea... its on the same damn island. If it were the Malay Peninsula then I would say through it in that South East Asian group. But since its a multiple land area thing... Include it in the other bonus and keep it one country. I think Indonesia made a grab for it after both Malaysia and Indonesia got independence and the Malay's repelled the invader quite well. Surely some exception can be made here. Look at the Europa map: Denmark, the Faroe Islands, and Greenland are all different territories; as are the constituents of the United Kingdom; as are Russia and Kaliningrad. It makes perfect sense that Taiwan be separate from mainland China -- you might even go so far as to separate Hong Kong/Macau from the rest of the country. Evil DIMwit wrote: Surely some exception can be made here. Look at the Europa map: Denmark, the Faroe Islands, and Greenland are all different territories; as are the constituents of the United Kingdom; as are Russia and Kaliningrad. It makes perfect sense that Taiwan be separate from mainland China -- you might even go so far as to separate Hong Kong/Macau from the rest of the country. Yeah, that's a good point. Taiwan does in fact have autonomy despite lack of recognition. HK and Macao are similar really. I could see them having their own territories as well. I feel differently about places like Phuket and some of those obscure islands in the Indian Ocean. Likewise for each of the Indonesian islands. It should all be one. This was my initial thought, too. Taiwan and Palestine both have some recognition and I tend to think we should use them--unless we don't need to (or if including Palestine is too difficult given the geography). I'd be wary of using Hong Kong and Macau since they are A) so tiny and B) have lost autonomy, rather than gained it. But if using them helps the map, I'm all for it. Indonesia is an interesting case. I was going to firmly state we shouldn't divide it, but then I think of the Balearics, Corsica, Sardinia and Sicily on the Europa map. I think if we stick with the larger islands like Borneo, Java and Sumatra, we could have something. Japan is tougher, though. I'm going to think about it a little and present a list of the territories I think we should use. Also, in order to focus gameplay, I really believe that the first big decision has to be what to do with Russia. The "European Russia" and "Asia Russia" is one option, but that sort of defeats the purpose of it only being an Asian map. What do people think of Russia being a starting neutral then a +1 autodeploy?